"There were many conversations within the team about whether it should be gender neutral" or "should have an 'attitude,' " said Mr. Winarsky, who didn't go to Apple, and still works at SRI. The result, before the software was bought by Apple, was "occasionally a light attitude," he said. According to a different person who actually worked at Apple on the Siri project, Apple focused on keeping Siri's personality "friendly and humble -- but also with an edge". According to their source, they were thinking "How would we want a person to respond?" while developing the software. The Siri group is said to be one of the largest software teams at Apple and the crafted responses are to try to forge an emotional tie to customers. MacRumors forum readers are posting their favorite responses in this discussion thread. 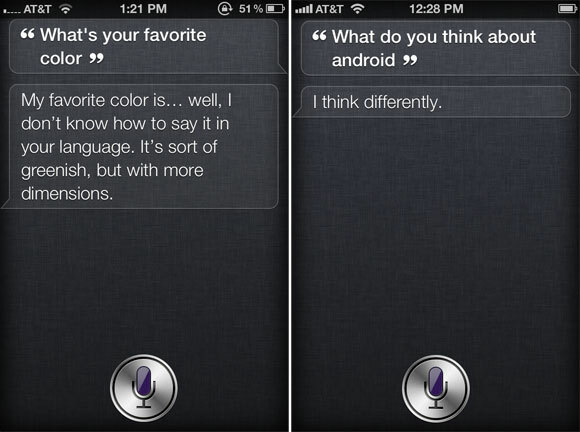 Siri launched as an exclusive feature for the iPhone 4S and allows users to speak questions and requests directly to their iPhone. I have been really impressed with Siri. Last night Siri blew me away when I said "Add oatmeal to my groceries note". I felt certain Siri wouldn't have any idea what I meant. A second later Siri says okay and pops up my already existing grocery list in notes and adds Oatmeal on a new line at the end of the list ... I was stunned. They should merge Siri with Cleverbot. No, they definitely shouldn't. Despite Cleverbot's name, it's actually dumb as a brick. Yes, but it's not what they use to contact the ship. That would be a communicator (TOS) or combadge (TNG). Tricorders are used to scan things. Yeah, but tricorders don't have "airplane mode" either. It was a joke. If siri said "your communicator is in airplane mode" that would be way too generic a tech term and some people would actually get confused and think siri was actually telling them an error message. When you're making a joke for *extremely* broad audiences in a technical context then you have to make sure that your joke can't possibly be misinterpreted. you don't think they're telling us something do you? I think they keep adding to the set of possible responses to questions like 'What is the meaning of life'. I see more and more varied responses as more and more people ask that question. But Apple SIRI team has access to everything. What people are asking and in what way. So, this personality will also develop as time goes by, since they can tweak it. They can also evolve it as the world around us changes and new cultural norms develop. One thing they do not have is the feedback mechanism. What are people's reactions to SIRI's output at each instance? Even a small sample of feedback is just enough. Like SIRI says something funny, the feedback is 'Siri, that is pretty cool'. Or 'that is disgusting'. Or 'you do not know anything. you are dumb'..whatever... That will be a treasure. But currently there is no conversational way to provide that feedback to SIRI. That is a bit unfortunate. In real world, that feedback is what helps people evolve a personality. There is still a UI way. After the SIRI response, before the next touch of the Mic, whatever the user says right away can be treated as that feedback. But SIRI has to be listening at that point. I do not think it does currently. But that can be changed. Siri has the same thinking ability as a rock. All of "her" spoken language is preprogrammed. Her attitude is preprogrammed. Humans are at least 1000 years from developing anything close to actual thinking. The human brain has evolved over millions of years.